It takes a 450 horsepower truck with an 80,000 lb. load roughly 90 seconds to accelerate to 50 mph but the brakes must be able to stop the truck in less than 5 seconds. Air brakes are used almost exclusively in heavy-duty trucks and trailers because they offer the following advantages. First, the air they run on is free. It only needs to be compressed, cleaned, stored and distributed. The air brake circuit can be easily expanded so trailers can be coupled and uncoupled from it. Besides providing the energy required to stop the vehicle, compressed air also signals when and with how much force the brakes should be applied in any situation. Finally, air brakes can be designed with sufficient fail-safe devices to bring the vehicle safely to a stop, even in the event of an air leak. 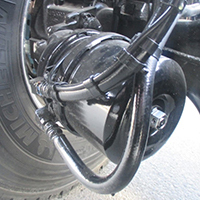 Reinforced rubber hoses deliver air from fittings on the frame to brake chambers on the axles. In a typical tandem rear suspension there are typically 8 brake hoses plus additional hoses for the power differential lock and other features for a total of 11. The hoses must be routed through a tight space and accommodate the full range of steering gear and suspension travel. The hoses are required to avoid contact with components with sharp edges that might wear the hoses, maintain a specified minimum bend radius to avoid constricting flow within the hose, and avoid axial forces high enough to pull out the hose out of the fitting.